America’s best-known pornographer, Larry Flynt, calls for the destruction of Downs Syndrome babies. He suggests that Down Syndrome babies, pre-born or otherwise, are undeserving of life because of their flawed condition, as he views it. In other words, they are not fully human, thus his characterization of them as an it. Downs children tend to have lower IQs and shorter life expectancies than the general population. Nonetheless, they know how to laugh, to cry, to love. I know, because my nephew has Downs Syndrome. His “love gene” is more developed than anyone I know. He loves people, whether family, friends, or strangers. He loves God and prays more robustly than I. 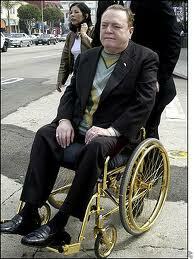 Using Mr. Flynt’s standard, one might ask Larry Flynt if HE is deserving of life in light of his own impaired condition. He is barely able to hold up his neck or communicate due to paralysis. Here is the question: is the definition of what is a person flexible, subject to the whims of the age? Pornographers view humanity threw a skewed prism. All are objects, whether it is their clientele who consume their product, or their casts who perform before the camera, only to be discarded when Father Time renders their bodies as undesirable. But what about the political left? Are they any better? After all they, view the object in the womb as an object from the moment of conception until birth, an object to be discarded at the whim of the mother for any reason at all. At least you can understand the pornographer’s motive: it’s all about the money. There’s no doubt that human abortion is big business, too. (Human abortionist Kermit Gosnell made millions aborting both pre and post born babies.) But that’s not the driving motive for the rank and file leftist. They are unable or unwilling to see the humanity of the baby in the womb. That is the ultimate obscenity of abortion. And yet the challenge mankind has had to face throughout history is to do just that: to see the humanity in his neighbor. When we let our prejudice and the dark side of our nature prevail, we end up with Holocausts and Slavery. The stakes are high. An entire group of human beings are on the verge of extinction. I’m talking Down Syndrome babies. Nine out of ten parents with a prenatal Downs diagnosis choose to abort their child. I am sympathetic to the challenges of raising a Downs child, having watched my nephew grow up. It’s not always easy. Most people would not make the choice. But those that do seem united in their decision: it was worth it. These so-called “impaired” human beings, these Downs children, seem to have an amazing capacity to make the word a better place. Can Mr. Flynt say the same? Wonder what the little people think about government snooping? Wow, he’s so ignorant. My aunt had Down’s syndrome and lived to be 40. And she was very human. She loved holding babies, loved coke, and cried during my grandfather’s first birthday after he died.. nobody told her it was his birthday, she knew. And I’d say that raising a child with Down’s Syndrome helps parents grow their patience. God knows why He does things, and I know He has many reasons for the existence of people with special needs! It’s great following this blog, God bless you sir! Thanks for the kind words. I really appreciate them. I think the world needs Downs people more than they need us. For an interesting take on the subject, read a novel called “The Clowns of God” by Morris West. It’s a page turner! Reading that, you have to wonder if Larry has ever even met a person with Down’s Syndrome. They most assuredly are not brain dead, they are certainly not vegetables, and anyone who has had the pleasure of knowing someone with Down’s is well aware that they are every bit as human as you or I. And arguably a lot more human than people like Larry Flynt. Good point, Bob. I totally agree.